Slate has announced the winners of their annual Cartoonist Studio Prize, which awards $1,000 to the year’s best print comic and webcomic. This year’s winner in the print catgeory is Keren Katz for The Academic Hour, published by Secret Acres. Winners of the annual award by Slate and the Center for Cartoon Studies will be announced March 30. Since her book War of Streets and Houses was published by Uncivilized Books, it seems as though Sophie Yanow has been publishing work on a regular basis. She’s become a significant comics journalist, regularly publishing pieces in The Nib and The Guardian and elsewhere, covering the protests at Standing Rock and the U.S. elections. This year she has two very different comics coming out. The New York Review of Comics has just released Pretending is Lying, a comics memoir by Dominique Goblet that Yanow translated. At TCAF, Retrofit Comics released What is a Glacier, which collects some of Yanow’s journalism comics. 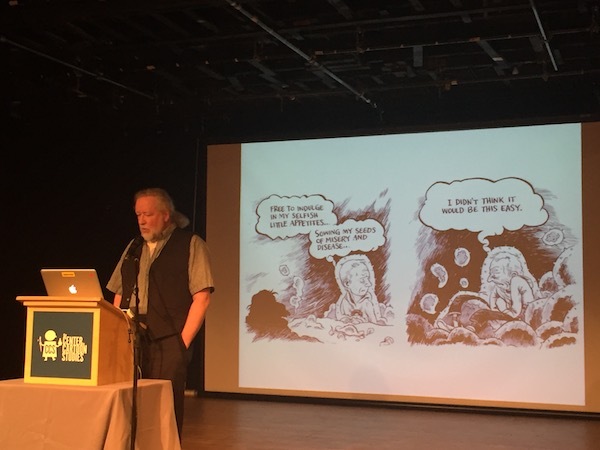 Yanow is currently teaching at the Center for Cartoon Studies in Vermont and this career model – making nonfiction comics, teaching, translation – has existed among prose writers and poets for generations, but it’s something new to comics. We spoke recently about Goblet, translation, nonfiction and the idea that Pretending is Lying.